October 1962—50 years ago this month, the Cuban Missile Crisis brought the Cold War and its threat of nuclear destruction to my hometown. To my fellow adolescents in Spokane, Washington, it was a fearful time. But the bombs didn’t fall, and now I look back at that month 50 years ago with great fondness. In October 1962, at age 13, I first became an Elvis fan. 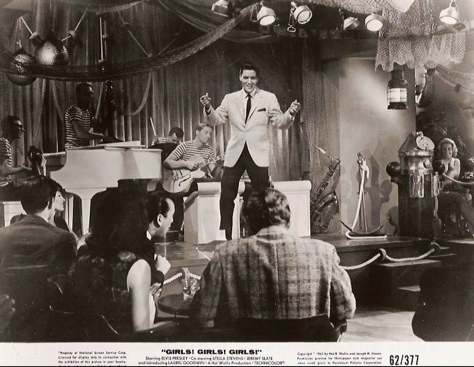 I can date the event to that particular month because my conversion took place soon after Spokane radio stations began playing Elvis’s “Return to Sender,” a Presley record released on October 2, 1962. It was not the first time I’d heard of Elvis or listened to his music. He had performed in Spokane in 1957, but at age 8 then I was too young to fall prey to rock ’n’ roll music. It wasn’t until about two years later that pop music became the soundtrack of my youth. It was 1959, and like most of my fellow “hip” fourth-graders, I was a faithful listener of radio station KNEW’s Top 40 sound. Soon we all had those small 6-transitor radios that allowed us to take our music to Natatorium Park, Doyle’s Ice Cream Parlor, and everywhere else we went. My brother and I shared a portable record player, and practically every Saturday morning I rode the bus downtown to The Music Box record store. My allowance then was a dollar a week, which allowed me to purchase one 45 rpm record. One entire wall of the store was covered with racks displaying the latest single releases. I’d take a few into one of the store’s record booths and play them before deciding which one to purchase. At first the syrupy pop sound that had replaced real rock’n’roll in the late fifties appealed to me. Frankie Avalon was my first singing idol and his “Venus” was one of the first records I bought. I also purchased 45s by Ricky Nelson, Dion and the Belmonts, and Bobby Darin. Nothing by Elvis though. He had already gone into the army, and although his records were still on the charts, he didn’t appeal to me then. I almost bought an Elvis record in 1961, though. All of my friends liked his “Surrender” that year. So one Saturday morning at The Music Box I grabbed that 45 off the wall, along with a few others I was considering for my weekly purchase, and headed into a play booth. I didn’t really care for “Surrender,” but when I turned the record over and heard the flip side, “Lonely Man,” I found an Elvis song I liked. That morning I wavered back and forth between the Elvis record and “Blue Angel” by Roy Orbison. Finally, I put my dollar down on the counter and walked out with the Orbison 45. Elvis would have to wait another year before getting my business. The fall of 1962 brought big changes to my life. I was starting junior high school then, and everyone was talking about President Kennedy and the Cuban situation. At age 13, I didn’t take it seriously, perhaps because the years of air raid drills in grade school and the weekly air raid siren tests had desensitized me to any sense of real danger. Perhaps I was converted during that intervention, but however it was done, it resulted in a fifty-year attraction to all things Elvis. “Return to Sender” became my first Presley record purchase. Issued in early November 1962, the soundtrack LP for “Girls! Girls! Girls!” was the first Elvis album I bought. About that time, my first paper route caused my income to soar near the $10 a week level, enabling me to buy many of Elvis’s back record issues. Since The Music Box kept past hit records on file, one day I purchased 45s of “Little Sister,” “I Feel So Bad,” “Good Luck Charm,” and “Surrender,” the record I had passed on the year before. Slowly, as my funds allowed, I began accumulating Elvis’s past LPs as well. There were 15 of them, and I was out to get them all. “Blue Hawaii” came first, then his first two gold record albums. That Christmas, and for several afterwards, my wish list consisted of nothing but Elvis records. Of course, I purchased every new Elvis album as it came out. The first was the “It Happened At the World’s Fair” soundtrack in April 1963. In those days, the mono version of an LP ran $2.98 and the stereo version was $3.98. Since they both sounded about the same on my little record player, I usually opted for the mono variety. When Girls! Girls! Girls! came to Spokane’s Fox Theater in late November 1962, I went to see it a couple of times. It was Elvis’s eleventh movie, and it soon became an obsession to see the 10 that preceded it. It would take years for that goal to be achieved. There were no VHS or DVDs in the sixties, of course, so I had to wait until those Elvis movies appeared on TV or were re-released in theaters. It wasn’t until after I graduated from high school in 1967, when Flaming Star played on local TV, that I could say I’d seen all of Elvis “old” movies. The Elvis collectible bug got me from the beginning as well. Every time I went into The Music Box, I checked the counter for free Elvis promotional items. Among the first I found there was Presley’s RCA pocket calendar for 1963 (pictured at right). I stuck it in my wallet and carried it around until the following year’s Elvis calendar appeared on the counter. Although October 1962 was a magical month for me, history reveals that while I became an Elvis fan when he was at the pinnacle of his success, it was also the beginning of a steady decline in his career. 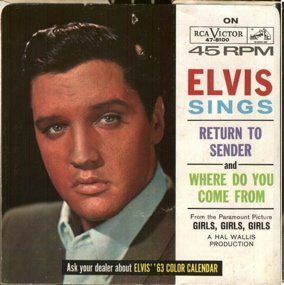 “Return to Sender” was Elvis’s twenty-fourth regular RCA single record. All of them made the top five on Billboard’s “Top/Hot 100” pop chart. Thirteen of them reached #1. The flip side of every one of those records also charted, the lowest being at #58. Although “Return to Sender” reached #2 on the chart, its flip side, “Where Do You Come From,” just barely made the chart at #99. 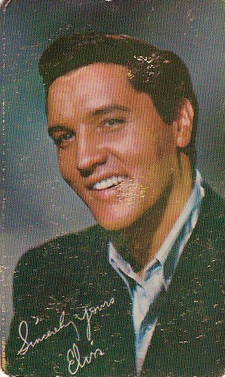 The next Presley single, “One Broken Heart for Sale,” was the first Elvis single not to reach the top five. In fact, it didn’t even make the top 10, stalling out at #11. 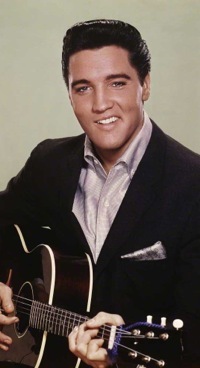 And “Please Don’t Drag That String Around,” the flip side of 1963’s “Devil in Disguise,” became the first Presley single side not to make Billboard’s chart at all, breaking Elvis’s string of 25 straight two-sided hits. After 1962, Elvis’s movies began to deteriorate as well. “Kissin Cousins” in 1964 started Elvis down the road to low budget musical comedies that ended forever his dream of becoming a serious actor. That same year The Beatles arrived and displaced Elvis from the top of the record charts. "The bombs didn’t fall, and now I look back at that month 50 years ago with great fondness. In October 1962, at age 13, I first became an Elvis fan."